Now my second, no wait third .22 AR15 including the one from another brand, I am learning that .22LR AR15s are one of the best training tools around and they pay for themselves in only a couple afternoons of high round count shooting. After testing and reviewing the Umarex produced HK416 .22LR AR, I decided I also wanted the Colt M4 Ops branded and patterned version as well for a couple reasons. First the Colt M4 Ops is a near perfect analog training stand-in for almost any standard carbine length AR15 on the market from both a weight and configuration perspective. Second is that once you own one of the Umarex HK or Colt .22 Rimfire ARs, all the magazines will swap back and forth which will most likely be your biggest investment in .22LR ARs.... somehow those magazines always seem to be empty or get there very quickly. Umarex USA is the team which designed and developed the HK & Colt licensed line of .22LR M16 and M4 models. If you are familiar with the much touted quality of either of these .22LR rifles, then it will come as little surprise that the internals, AR style magazines, barrels, and accuracy has been duplicated in both the HK and Colt models and so many of my points will be the same if not identical to my HK 416 review. At this point I own all the major brands of .22 ARs and I can say the Umarex Colt is very solid well built gun with excellent fit throughout. Unlike the S&W AR I have, pretty much everything on the gun that can be made of metal is with the exception of the rear sights. The front and rear take-down pins on the HK were aluminum, the Colt’s are steel. The HK’s front sight was plastic but and the front sight on the Colt is metal. The finish on all the aluminum bits is of high grade anodizing however is does not specify what Type (I, II, or III) anodizing and the upper and lower are an unspecified type of aluminum. My assumption is that it would be tough to hit this price point with a 7075 Type III anodized receiver set when a lesser expensive aluminum and finish would work perfectly in this situation. 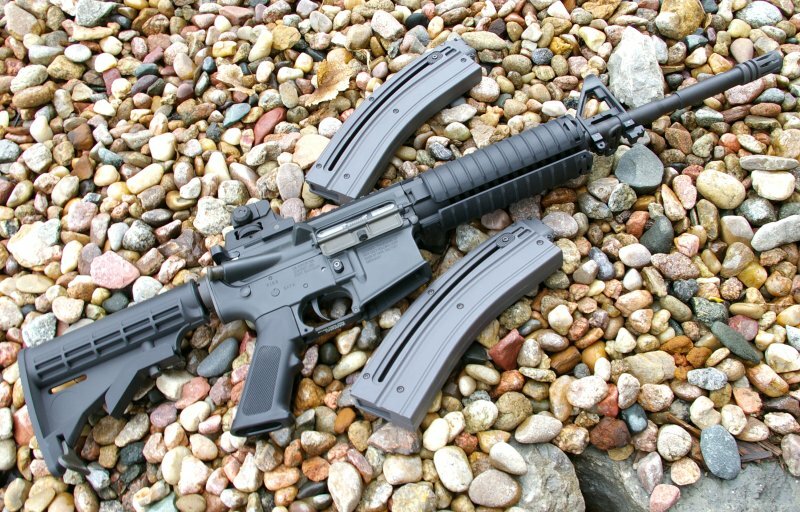 At 5.9lbs the .22LR Colt M4 Ops is lighter than a typical 7-7.5lb 5.56 version. One of the things I really liked about the HK and carries through on the Colt M4 Ops rimfire AR15 is enough heft to make it feel real vs my uncharacteristically light like my S&W .22LR AR which I keep threatening to add a lead weights to. Most of my basic ARs hover around the 7lb mark naked, so training with the Colt M4 Ops .22 rimfire AR15 will provide a more similar weight feel to a standard AR. Having a gun feel right from a weight and ergonomics perspective is the right step forward for realism and training. 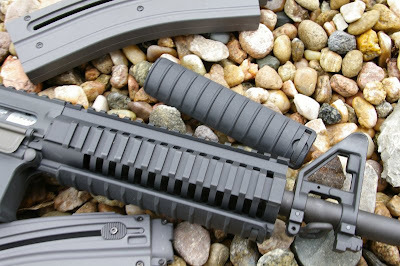 The internals are also unique to Umarex differing significantly from the standard Ceiner style AR conversions. On the outside the trigger feels like a really nice AR trigger but are drastically different internally than any standard AR and same goes for the bolt assembly. Part of the internals redesign was to reduce jams and cleaning after firing those very dirty little .22LR rounds. To do this Umarex developed semi-sealed lower and upper internals on the receivers for less maintenance. The other two goals were to maximize accuracy and reliability which they did with a proprietary bolt design and spring which can be adjusted and tuned for more or less spring tension via a hex wrench. This maximizes reliability with faster or slower .22 rounds. To test this, I used Aquila Super Sniper sub-sonic ammo which historically has not functioned well in my semi-autos and still enjoyed more neighbor friendly shooting and perfect reliability after I reduced the recoil spring tension. For most ammo, you will never have to tune the spring, however it is a great feature to be able to tune the reliability for hot or cooler velocity rounds for optimal reliability. Like the HK model the Colt M4 Ops features that same awesome shooting Carl Walther match grade barrel liner. 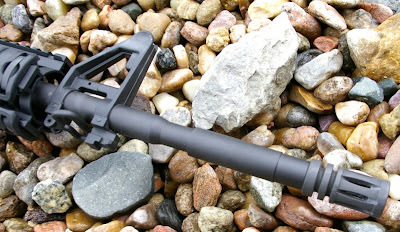 Some may want to swap out the flash hider for other accessories, however the flash hider has smaller non-standard threads, so expect to stick with the stock flash hider unless someone makes an adapter. 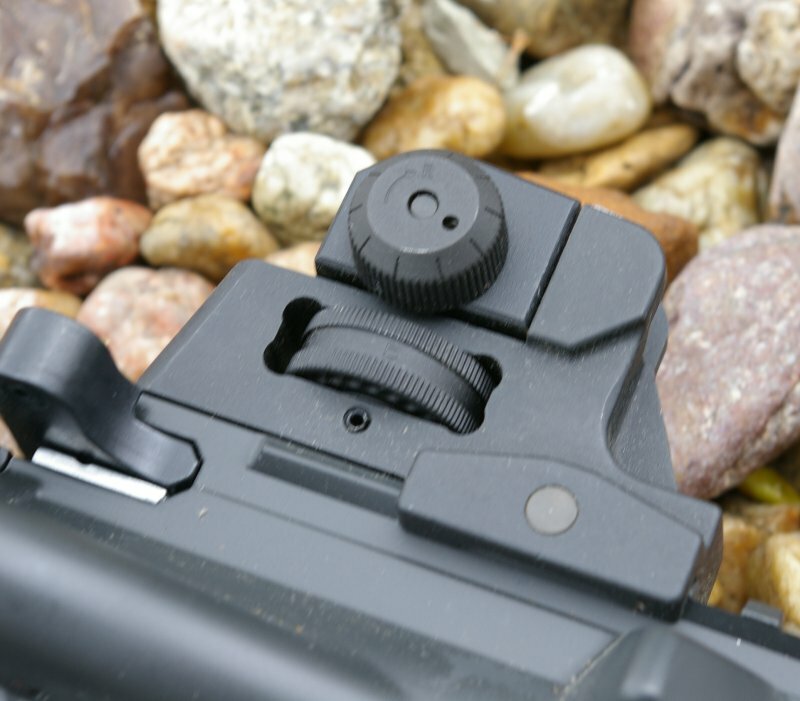 Sights are standard fixed front “F” marked AR gas block style and the fixed rear are standard looking removable picatinny sights. Unlike the problems I had with the HK version, I had no issues zeroing the Colt for a 25 yards zero. 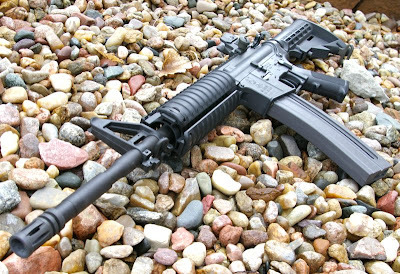 Many of us want an exact operational and functioning duplicate of our current AR in .22LR and the Colt M4 Ops .22 rimfire AR15 comes close just like the HK version did. 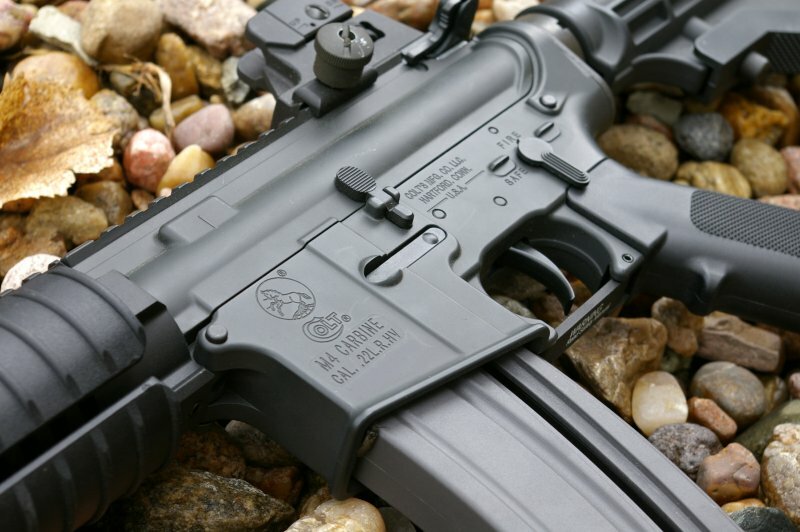 Operation of the Colt M4 Ops .22 rimfire AR15 is a standard blowback system with full functioning dust cover. The bolt hold open catch is actuated via the thumb helper on the magazine and pushes up on a metal bolt hold open catch after the last shot. Unlike typical AR bolt conversions which hold the bolt open as long as the empty magazine is in place, the bolt on the 416 is held open even after the magazine is removed. The end result of these mechanics is that the magazine can drop free, which allows you to practice your reloads, however the one major shortcoming is the inability to release the bolt via the standard bolt release. The forward assist and bolt release are disappointly non-functioning when it seems from the location of both that they could have been engineered to work. The method of loading on the Colt M4 Ops .22 rimfire AR15 whether the bolt is held open after a last shot or not is to insert a fresh loaded magazine, and charge a round by pulling back on the charging handle. Definitely not standard manual of arms for practicing tactical reloads and I think one of the reasons the S&W wins the reload battle. That said once the magazine is in I like the Umarex Colt and HK better. They shoot smoother, are tunable for various ammo, run cleaner and are far more accurate. The magazines for the Colt M4 Ops .22 rimfire AR15 are more durable and higher quality than my S&W M&P 15-22. The Colt versions are made of high-strength polymer and are the best .22LR AR magazines I have had the pleasure of using but they are not compatible with more prevalent .22LR AR Black Dog magazines. They make reloading simple and fast with the thumb tabs on each side and include what feels like a constant force spring. The Magazines are available in 10, 20 and now 30 round versions. The 20 round magazines will most closely match the size of your standard AR magazines. The trigger is very good with the feel of a two-stage trigger. There is a gradual take up and definite transition to the fairly crisp second stage. Throughout all the testing, I was very impressed with the reliability, perfect feeding, and firing of everything from standard velocity to CCI Stingers. I did have a couple failure to feeds after everything gunked up about the 600 round mark so plan on cleaning around that point. For the record my S&W had feeding problems before that round count. Like all the .22LR H&Ks and Colts offered by Umarex, the Colt M4 Ops .22 rimfire AR15 is a dedicated .22 rimfire rifle which is engineered and built in Germany by Carl Walther. Accuracy is excellent with the match grade precision barrel and delivered nearly identical accuracy to my HK. I bested my HK’s 10-shot group by .1” with a .4” 25 yard open sighted. This gun easily shoots as well as my Tactical Solution match barreled 10/22, but is loads more fun to shoot. This is one of the major reasons I love the Umarex HK and Colt line, they are incredibly accurate. As I am using these as training and fun guns they will probably never see a scope, however with one of those .22LR AR scopes, I am sure this would be an awesome hunting and rodent gun with sub-.75” shooting all day long with even less expensive ammo. Like the other Umarex, there is a lot to love about this gun and I probably like the Colt M4 Ops rimfire AR more than the HK version when it comes to an AR training tool. Because the Umarex Colt line is simpler than the overall design of the fancy HK, it seems they are able to upgrade some of the little things that bothered me such as a metal front sight, and steel take down pins on the Colt. 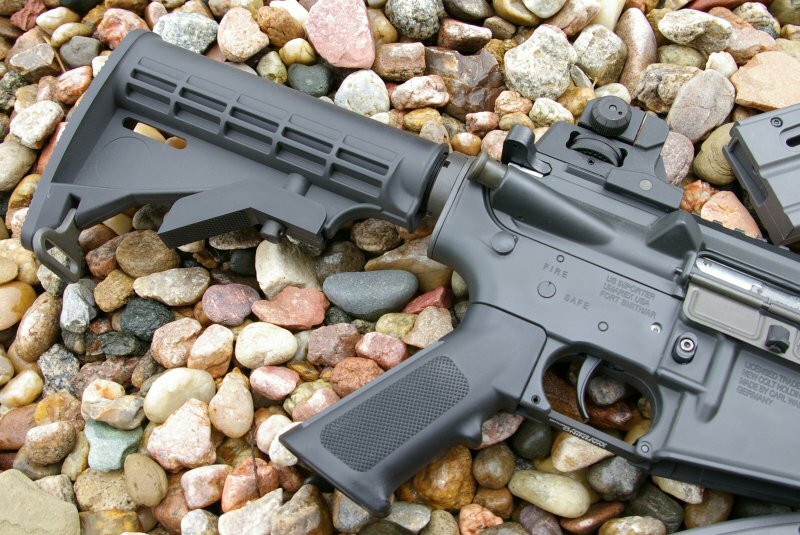 The Colt M4 Ops is definitely a higher quality gun than the polymer framed S&W M&P 15-22. I of course own both the HK and Colt branded Umarex rimfire ARs and the S&W version as well, but the only reason I do is because of the bolt release capabilities of the S&W to practice reloads otherwise the Umarex line is the clear winner for me. The Colt M4 Ops provides an overall higher quality, higher percentage metal build, more realistic weight and feel, tunable carrier for various loads, higher quality magazines, and far superior accuracy with the German made Carl Walther barrel liner. Running the majority of AR training, dominante to weak shoulder transitioning drills, and speed shooting drills, I reach for the Colt. It shoots smoother and more accurately and most importantly feels like the weight of a full caliber 5.56 version. Just like the HK version the Colt M4 Ops .22LR rimfire AR delivers on look, fit, function and certainly accuracy and reliability, just remember to pick up plenty of extra magazines, because you will be shooting this gun a lot. All three of my .22 caliber AR rifles have paid for themselves in very short order. In my HK review I shared some math, however I will have refined my justification for the purchase of a rimfire AR for training further. The least expensive reliable .223 ammo I can find for training and plinking is $5.99 a box of 20 or calculating it out $14.98 per 50 rounds. For .22LR plinking ammo I usually reach for something like the Federal 325 count box for $13.99 which comes out to $2.15 per 50. Comparing .223 to .22, that is a $12.83 difference per 50 rounds. 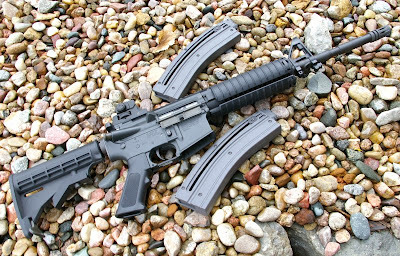 On a rimfire AR15 such as the $500 street priced Colt M4 Ops, it only takes 39 boxes of 50 .22LR or 1950 rounds and the gun paid for itself. I am not sure about you but 2000 rounds of .22 ammo goes quick over just two range days for me at the range. At that point, using the .22 rimfire AR is saving you a bundle when training. Just make sure your 25M zero is the same on both your 5.56 AR and your .22LR AR. I use this printable 25M AR zeroing target from BobdBob.com http://www.bobdbob.com/~deneb/doc/targets/m16a2-25m-zero.pdf for all my AR and .22 Zeroing which is simply the best target I have found for that purpose.